Fermented foods are extremely beneficial for our health. One of the main benefits is that our body more easily absorbs the nutrients for healing. In this way, we can improve our digestion and help the digestive tract. Our gut needs healthy bacteria and when we supply it with these bacteria, the digestive process can more effectively destroy the harmful bacteria. Moreover, these bacteria help our body to absorb the nutrients from the food that we consume. Our gut can help to protect ourselves from various illnesses. So, this means that adding the healthy bacteria (found in lacto-fermented foods) to our diet can significantly strengthen our immune system. It can control immune cells and prevent some autoimmune reactions, including inflammation. Our brain is connected with our immune and digestive system. Just think about the last time you had cold or flu and how fuzzy your head felt and you will understand this connection. In fact, the vagus nerve is responsible for all this. This nerve is one of 12 cranial nerves responsible for the transfer of information from our intestinal nervous system to the central nervous system in the brain. So, limiting unhealthy bacteria and maintaining the healthy bacteria can keep the proper functioning between these two systems. Lacto-fermented foods are a great source of potent antioxidants which has the ability to destroy free radicals that can contribute to cancer. These antioxidants can prevent inflammation and boost the immune system. In other words, this will help you treat arthritis, eczema, and other inflammation or autoimmune response-related conditions. Lacto-fermented foods are extremely beneficial for the regulation of some hormonal functions. In this way, you will be able to control your food cravings as well as suppress your appetite. According to many studies, people with a high intake of healthy probiotics have a reduced risk of obesity. When preparing Lacto-Fermented onions, we highly recommend to use natural salt such as Himalayan pink salt, Celtic sea salt, or kosher salt) since there have a rich content of minerals unlike the table salt used in commercially-prepared fermented foods. Fermented onions can be added to your sandwiches, salads, in your tacos or nachos, eaten on their own or as condiments with your meals. You can use the onions whole or slice them. In order to prepare the brine, you should dissolve 50g of salt in 1 liter of water. 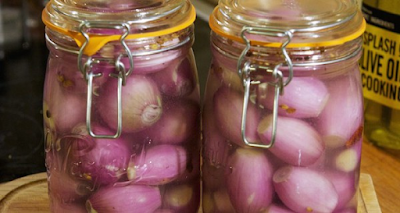 Put the onions in the jars and make sure that the jars are more than half full. Pour the brine over them and let 1-2 inches headspace. You should cover the jars with their airtight lids. Keep them at room temperature, until you obtain the desired flavor and texture. It is recommended to open the lid every day for the first 2 weeks, in order to release the accumulated fermentation gas. After the first 2 weeks, you should open it every other day. The process of fermentation can last up to 1-2 months. If you notice that your jar smells putrid when opening it, make sure to throw it out and start the whole process over again.